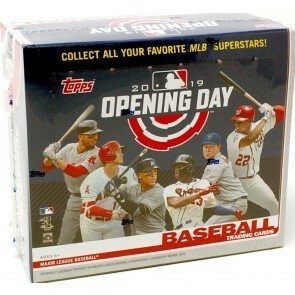 2019 Topps Opening Day offers fans of all ages a fun, entry-level baseball card collecting product. 2019 Topps Opening Day is filled with dynamic in-game photography of fan favorite players and mascots, inserts that celebrate “America’s Pastime”, rare base card parallels, autographs and relic cards. NEW! Sock It To Me! Featuring players celebrating, performing team signs/handshakes, wearing rally caps, and other “rally-time” superstitions. Up to 20 MLB rookies and stars are celebrated on cards that also have their signature. Collectors will “Own the Game” with these cards that contain pieces of game-used memorabilia. Featuring a player and dirt from the baseball diamond from his home stadium. Look for special autograph versions!